In the previous episode of this series about how to develop a Windows Phone application from scratch we talked about restoring the entire page state after the application returns from the background. Today we finally are going to add a Secondary Tile to our application. Each application has at least one tile, the Application Tile, which end users can pin to the start screen on their phone. In the very first episode of this series we defined the contents for the backside of the Application Tile in the manifest file of our application. Each application can also create one or more Secondary Tiles. 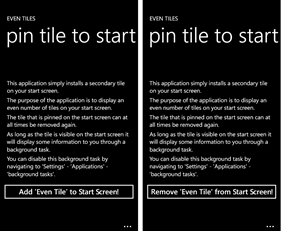 Once a Secondary Tile is created programmatically, it will immediately be pinned to the start screen. Secondary Tiles can be removed again programmatically, but the end user can also remove Secondary Tiles from the start screen of their phone. To add a Secondary Tile to the start screen, our application’s MainPage will host a button. When the user clicks the button, a new Secondary Tile is created. After creation, our application is moved to the background by the operating system in order to show the start screen with our newly created secondary tile, that is initialized in such a way that it contains both a front- and backside. You can see the Secondary Tile being pinned on the start screen. You can also see that the Secondary Tile has two different sides, each with their own image and the backside containing an additional string, the string that the user can enter in the SettingsPage of the application. 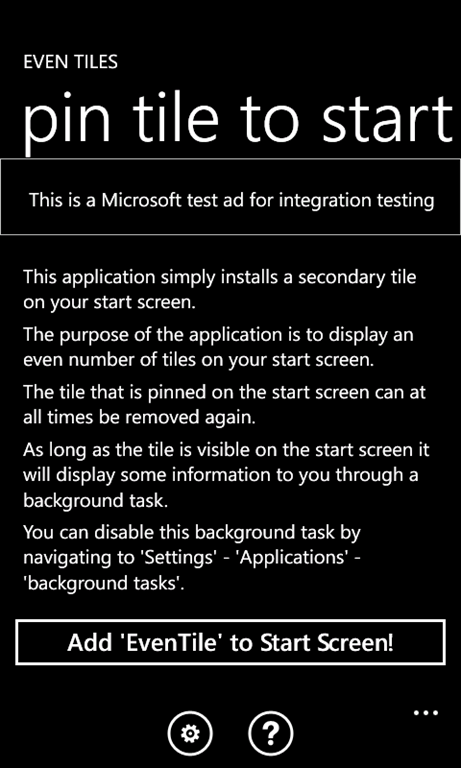 If the user returns to the application when the Secondary Tile is installed, they have the possibility to remove the Secondary Tile again from the start screen programmatically. In the above code snippet the first thing we do is verify if a Secondary Tile is installed. If so, we simply call the Delete method on it to remove it from the start screen on the phone. As visual feedback to the user, we immediately change the content property of the button to show a string to add another Secondary Tile. If we don’t have a Secondary Tile, what we are going to do is create and initialize a new instance of StandardTileData. Through its properties, this object will hold the complete characteristics of our new Secondary Tile. To create the Secondary Tile, we simply call the static Create method of the ShellTile class, passing a navigation string, indicating to which page we should go in our application when the user clicks the Secondary Tile. In this way, you can use Secondary Tiles to link to any page inside your application. You can also pass your own parameters to the navigation URI, which can help you take different actions if a page is invoked from a Secondary Tile. Together with the navigation URI, you also pass the StandardTileData to create the Secondary Tile. Immediately after calling the ShellTile.Create method, our application is moved to the background by the operating system and the start screen with our newly created Secondary Tile becomes visible. If you click on the phone’s back button, our application returns to the foreground (from either a tombstoning or dormant state). On the other hand, if the user clicks on the Secondary Tile, a new instance of our application is started and the instance of our application that was still available in the background is removed. This behavior implies that we don’t have to modify the text of the button in case of creating a live tile, because OnNavigatedTo will always execute before our MainPage becomes visible again. The following video shows step-by-step how to create and delete Secondary Tiles programmatically. It also shows our Secondary Tile in action. Of course, this sample application is very simple, but hopefully you can see the potential, not only for having Live Tiles available for an application, but also to make use of Secondary Tiles to allow the user to immediately navigate to a particular page of your application. In the next episode of EvenTiles we will introduce a more advanced topic when we are beginning to talk about making use of a background agent to allow our application to execute some code, even when it is not in the foreground.